A suite of common ecological impacts ofroads are shown as labeled arrows. While these effects are well described in roadecology, their role as known or likely agents of natural selection is poorly understood.Yet these factors are capable of driving contemporary evolutionary change. Studying the evolutionary effects of these factors will provide a more comprehensiveunderstanding of the ways in which organisms are responding to the presence and consequences of roads. (This is Figure 2 from the paper). Credit: Graphic created by Steven P. Brady using symbols courtesy of the Integration and Application Network, University of Maryland Center for Environmental Science (ian.umces.edu/symbols/). Roads are causing rapid evolutionary change in wild populations of plants and animals according to a Concepts and Questions paper published in Frontiers in Ecology and the Environment. The paper is available now online in 'early view' ahead of being featured on the cover in the print edition on March 1. Said to be the largest human artifact on the planet, roads impact the ecology of nearly 20 percent of the U.S. landscape alone, and globally, are projected to increase 60 percent in length by 2050; yet, how roads are triggering contemporary evolutionary changes among plants and animals, is a topic that has typically been overlooked. By drawing on previous studies, the researchers show that the numerous negative effects of roads - such as pollution and road kill - can cause rapid evolutionary changes in road-adjacent populations. 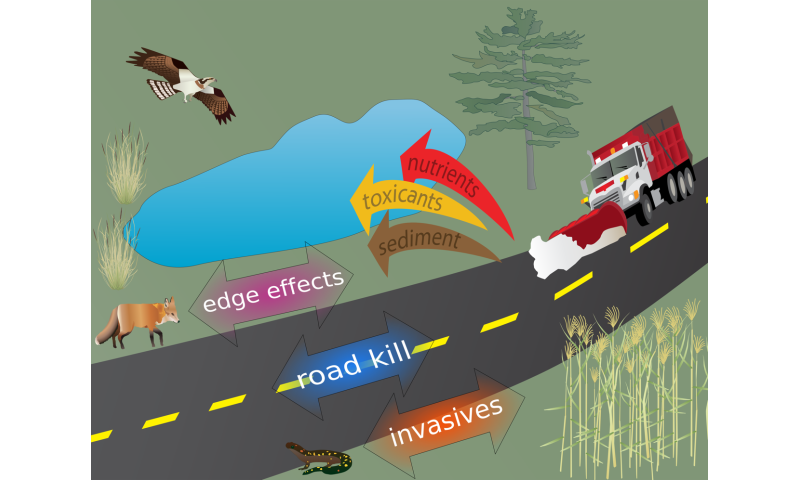 This finding that roads spur rapid evolution is transforming scientists' views of the biological impacts caused by the ever-expanding network of roads.Over a period of just a few generations - and in one case in as few as just 30 years - some populations living in road-adjacent habitat are evolving higher tolerance to pollutants, such as road salt runoff; the common grass Anthoxanthum odoratum is one such example, the spotted salamander (Ambystoma maculatum) is another. Despite this positive influence of rapid evolution, road-adjacent populations are not always able to adapt to life beside the road, at times becoming 'maladapted,' evolving lower tolerances to negative road effects. This can occur even if other species in those habitats are adapting, as was the case with the spotted salamander and a cohabitant frog. Earlier fieldwork by Brady found that the survival rate for wood frog Rana sylvatica populations living by the road was 29 percent lower than those transplanted from other areas. With the spotted salamander and wood frog, the fitness of each population had increased and decreased, respectively, relative to populations not living roadside, which demonstrates how local adaptive and maladaptive changes are occurring through natural selection among various species. Even though a population may experience local adaptation, the researchers point out that while evolution might decrease the chance of local extinction, it does not preclude it. "We have long known that slicing and dicing our planet with roads presents many challenges for plants and animals but we are only now beginning to appreciate that those same challenges can drive evolutionary change over just a few generations. This forces us to reconsider the nature of road effects and the complexity of ways that life responds to them," says lead-author Steven P. Brady (http://stevenpbrady.weebly.com/), a biologist in the Department of Water and Land Resources at King County in Seattle, Wash., who was a post-doctoral fellow in biological sciences at Dartmouth College, when the paper was written. Brady was a member of Ryan Calsbeek's Lab in Evolutionary Ecology at Dartmouth. "It is striking to consider that across such different organisms - grasses, swallows, amphibians - roads have similar capacity to cause divergent evolution among local populations," says Brady. "But what is perhaps most surprising is that some populations appear to be evolving maladaptively right alongside populations that are evolving adaptively. And from what we can tell, such maladaptive outcomes may become increasingly common in response to human-modified environments such as road-adjacent habitats." The evolutionary perspectives of road ecology is integral to understanding how roads are impacting our environment, and to planning for and implementing conservation efforts. As new roads and infrastructure projects are considered by local, state and federal municipalities, including the prospect of a new U.S. infrastructure program, an integrated policy approach that considers maximizing the connectivity of habitats, preserving genetic diversity and increasing population sizes, may help "mitigate the consequences of roads."